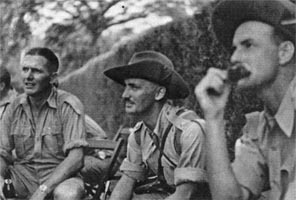 The Malayan Volunteers Group (MVG) developed from an informal gathering of a few British Malayans who were Volunteer Veterans. They used to meet for an annual lunch-time get-together, to talk about times past and to enjoy each other's company. As their numbers gradually decreased over the years, the tradition was carried on by their children and families. Now the lunch-time meetings every October are growing in numbers, as new members join the Group. In January 2005, there seemed to be a need to keep British Malayan families in touch with each other more frequently than once a year, and so the Malayan Volunteers Group was formed, with a quarterly newsletter called "Apa Khabar" in which news and views are exchanged by members, both here and in different parts of the world. To educate and raise historical awareness of the Malayan Volunteers in the U.K. and worldwide, and to gain recognition for their unique role in the Malayan Campaign and in captivity. To re-introduce British Malayan Volunteer families and other Volunteer families, of all races and creeds, who have lost contact over the years, and to help them keep in touch with each other. To help these families and other interested parties research their own and/or other people’s Malayan Volunteer connections. To raise money to commemorate the Malayan Volunteers by the presentation of new memorials and restoration of existing ones, both in the U.K. and in other parts of the world where Volunteer families have settled.